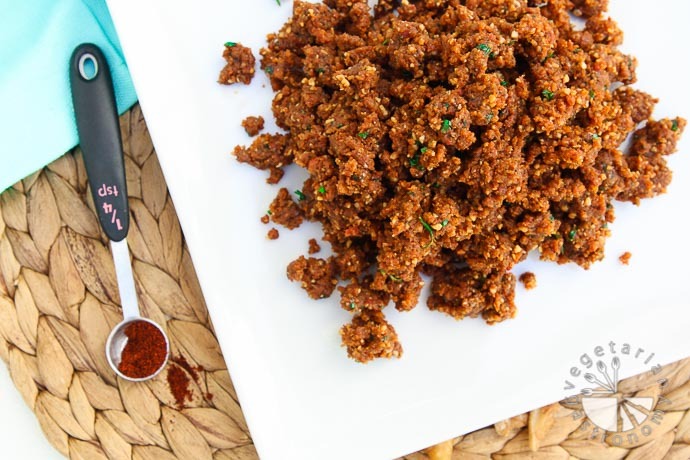 Have you ever tried the store-bought soy crumbles or the faux meat “chorizo”? Well I have, and I’ve never been a huge fan. I know a few friends who love the stuff and add it to burritos, breakfast scrambles, tacos, salads, etc. I’ve always liked the concept of a savory crumble you can add to a variety of different dishes, but the flavor/taste, texture, and long list of ingredients in the store-bought packages always kept me away. Not to mention, most of the store-bought brands aren’t the healthiest. Well after being inspired by a recent taco salad I picked up from a local juicery, I thought why not make my own version of a savory crumble. That’s exactly what I did with this Savory Walnut & Sun-Dried Tomato Crumble recipe, and I can honestly say I’m in LOVE with this stuff! 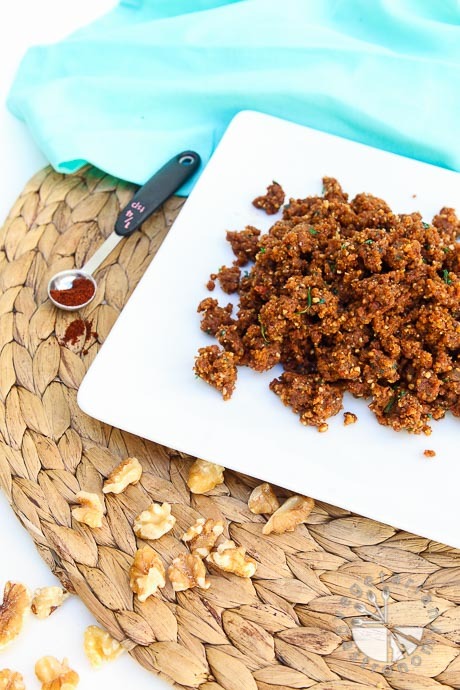 This Walnut & Sun-Dried Tomato Crumble is EVERYTHING I’ve been looking for…easy to make, made with healthy and good-for-you ingredients, crumbly for easy use in a variety of different dishes, very flavorful, and just delicious! Simply grab all the ingredients, add into your food processor, and pulse until it reaches the crumbly consistency. 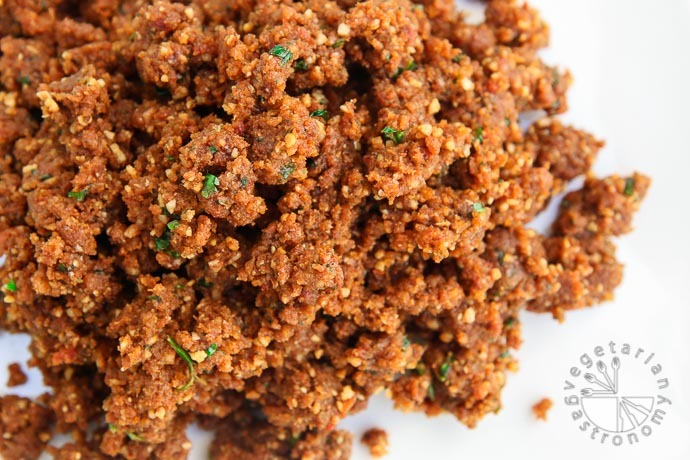 You can think of this savory crumble as a vegan “chorizo”, but since I’ve never been a huge fan of fake-meat products and labels, to me it’s really just one of the BEST nut-based savory mixes I can crumble onto or stuff into a lot of different types of dishes. If you’re looking at the ingredients and thinking you don’t have all the spices at home, I highly recommend going to the store and buying them because I guarantee that once you make this once, you won’t be able to stop, and so those spices will be used. 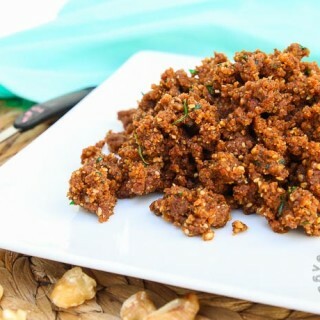 Or if you’re thinking that you already like the store-bought soy crumbles, then you definitely need to try my version – it tastes much better, is very easy to make, and is clean. Coming up are two recipes using this Walnut & Sun-Dried Tomato Crumble, ones you definitely won’t want to miss. But until then, gather all the spices and ingredients, and make this crumble. You can add it to just about anything – burritos, tacos, breakfast scrambles, salads, etc. If you make it, be sure to Tag me on Facebook or Instagram @vegetariangastronomy , #vegetariangastronomy, so I don’t miss it! I love seeing and sharing all your re-creations. This vegan crumble is the best taco "meat" to add to everything! Made with whole ingredients, flavor-packed, and the perfect way to add in that protein! Add all the ingredients into a food processor . Pulse 10-15 times in the food processor until all the ingredients are well combined and the mixture becomes crumbly in texture. Be sure not to simply turn on the food processor, but rather to make quick pulses until you achieve the desired consistency. The finished product should be able to stick together, but at the same time easily separate and crumble onto different dishes. Add additional salt and/or lemon juice to taste if needed. Store in the fridge in an airtight container for a few days. Enjoy over salads, in burritos, tacos, tofu scrambles, etc. Sun-dried Tomatoes - I used Julienne sliced sun-dried tomatoes in olive oil. Scoop the sun-dried tomatoes out of the jar, and place in a small strainer over a cup or bowl. Allow the olive oil to drain out as much as possible (save oil for cooking or discard in trash). Pat the drained sun-dried tomatoes with a paper towel and use 1/4 cup packed of these sun-dried tomatoes in the recipe. You can also used dried tomatoes (not in olive oil) and simply add oil if needed for consistency. This looks sooooo good Anjali. I am not a huge fan of Soya products but this looks great! It's delicious! And it's not made with soy, which is why I actually love it! Try it out if you get a chance...I know you'll love it as well! This looks amazing!!! I was never a fan of that soy chorizo...way too greasy and just didn't sit well. 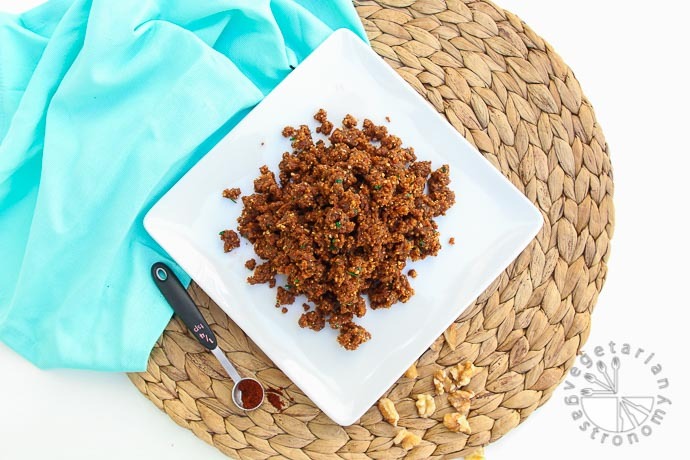 I've made walnut taco meat before, but the ingredients you've used here sound so flavorful. I can definitely see using this on a taco salad or in lettuce wraps. I'll have to make this next taco Tuesday!! Me too...never been a fan of the soyrizo (not to mention, you're right, it never looks good! )...but have always sort of liked the concept of having that savory crumble to add to anything. Well you will love this! And speaking of taco salad...wait till you see next weeks post of JUST that! =) Now I'll have to work on getting that post up for you on Monday pr Tuesday so you can make the taco salad or some form of it =) I've also used your chipotle tahini dressing I mentioned on next weeks taco salad recipe since I ran out of cilantro one day (as well as the one I'm posting)...both taste awesome! Can't wait to hear what you think...let me know if you try this! Every ingredient looks solid-- except I'm wondering if you might recommend a substitute for the sunflower seeds. My wife has a sensitivity to them, and I'm anxious to give the recipe a try. Please advise. Thanks Jim! Yes, you can easily leave out the sunflower seeds and add a few more walnuts to the mix instead. Although I haven't tried this myself, I imagine it won't alter the taste. Season with salt or additional tamari as needed at the end after tasting! Let me know how you guys like this recipe if you try it out! Next monday I'm posting one of my favorite recipes using this mix, but of course you can easily use this for almost anything! Enjoy! Yum, yum, YUM! Killer recipe!! I almost are the entire thing in one sitting! The crunch and spice are a great combo! Great picnic food! Thanks for sharing this recipe! Yay! Happy you loved the recipe! I can't get enough of it either...I think i've made the crumble every other week. Picnic food - what a great idea! Thanks for following and trying out the recipe! this is soooooo good! I was eating it plain!! It's so versatile, you can do anything with it...and yes, that means even eat it PLAIN! =) Whenever I make it, I seriously create so many new dishes with it. Can't wait to post some more recipes soon using this crumble! That's so great to hear!! I'm addicted to this stuff as well! In fact I just made it into a bite-sized appetizer/taco recipe and it was a huge hit! Thank you so much for trying out the recipe and letting me know! I'm honored that you think it's the best you've had! This is delicious right out of the food processor! I'm having your ultimate taco salad for lunch, as soon as I make the cilantro dressing! Thanks for trying out the recipe Devi and so glad you loved it! You will be having this for lunch all week i'm sure of it! Oh my goodness!!! I just made this and added it to our roasted vegetable quesadilla's- wow!!! So flavourful, so easy and the kids ate it!!! I stopped buying veggie ground round because nobody ate it... This will be a constant in my kitchen! You are fantastic!!! That's so awesome to hear Amee! Thank you for trying it out! It's one of my favorite recipes and goes so well with so many dishes! I have so many recipes on my list to develop using this crumble...your roasted veggie quesadilla sounds delicious! Exciting your kids ate it also! Yeah, I've never been a fan of veggie ground round...don't care for the taste and it's not the healthiest but I've always like the idea of having that something to add hence this recipe. Thanks again for the wonderful feedback! It goes well in both! I've been drooling over this for awhile now. I can't wait to try it. It looks amazing! I can't stand the store bought crumbles - yuck! And sun dried tomatoes are one of my favorite things. Same here Jenn...can't stand the store-bought crumbles, but loved the idea of being able to add something like that to a variety of different dishes, which is why I NEEDED to create my own recipe with my own flavors and make it healthy! Out came this recipe and it's been a HUGE hit!! You will love it! Let me know if you try it out (btw...I'd suggest you make a double batch ha)! This is our favorite walnut "meat" of all time! I've made this a dozen times since Anjali first posted the recipe and every single time it surprises us with how delicious it is! The sun dried tomatoes make it burst with flavor. Tonight we used it for tacos and we've used it over salads, for breakfast, in burritos and everywhere else a pop of flavor is needed. So simple to make and absolutely delicious! Thank you Diana!! I love that it's your favorite walnut "meat" of all times, and thank you for trying out my recipe and sharing on IG! This recipe has been a huge hit with so many and I've loved seeing all the different ways people have been using it! I think after seeing your picture on IG, I was craving it and ended up making a double batch of it for myself for the week ha! Thanks again so much for the wonderful comment! Thanks Uma...I know right? I love recipes that are versatile and can be used for a variety of different dishes. Yep...you can add this to salads, burritos, tacos, enchiladas, tofu scrambles, and I've even had another follower add this to pasta a long with some marinara! It's wonderful! This is such a great recipe. I just bought Upton's chorizo yesterday, now I'm going to have to try and make my own. Thanks for the great recipe. Thank you! 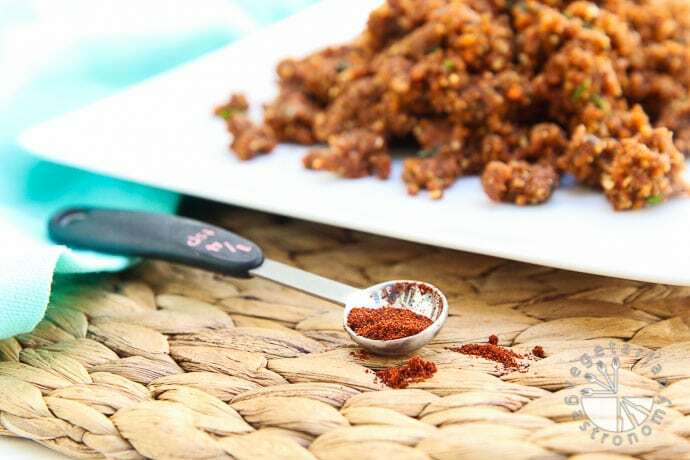 Oh you will LOVE this home-made version so much better than the store bought chorizo. It's actually why I developed the recipe. I loved the concept of chorizo to add to anything, but have NEVER been a huge fan of the store-bought version. This one is so flavorful, made with healthy ingredients, and tastes awesome! I always make double batch and add it to everything throughout the week! You need to try it Linda! How easy is that to make? I love all those wonderful flavours you have packed in there too.Great recipe! Thanks Mel! It is VERY easy and great to have on hand for the week to add to just about anything! These sound so good! I definitely want to put them in tacos! Looks delicious! Thanks Vanessa! I developed this recipe specifically for tacos I'm posting about soon, but it also goes so well with many other dishes! I made this and it is PHENOMENAL!! I had on a wrap with roasted eggplant, follow your heart provolone slices and spinach. The wrap's flavors were so amazing and the only seasoning was the savory walnu sun-dried tomato crumble!! I'm definitely making this again. So easy! Thank you so much for the review and comment, not to mention what a great idea!! I have yet to use it in a wrap, although I do have a breakfast burrito in the works. But I saw your IG post and loved it. Thanks again for trying out my recipe and tagging me on social media! Hi Puja! Thank you so much for trying it out and SO glad you guys loved it! It's really addicting once you try it =) What type of blender do you have? Food processors are ice because it gets that crumble texture, but it's worth giving it a try. What about one of those smaller 3-in one processors? The attachment that comes with a hand blender, mini processor, and whisk? Something like this one I used it all the time before I had a large food processor and i think in small batches it'd work perfectly. Thank you for this delicious creation! My version involved swapping pumpkin seed for sunflower, a total neglect of measurement, and a Vitamix blender. It came out more like a tapenade or curry paste. It's umami concentrate --- I love it! I'll be smearing and mixing it into everything this week, for sure. Best wishes. Thank you Erin for the great review! So glad you loved it...it's one of my favorite creations! I'm sure swapping pumpkin for sunflower still tasted great! Nice to know you made it in a vitamix...I've been meaning to try it since a few have asked and assumed you'd get the same texture you described. Great to know it still tastes good made in a vitamix. And yes...totally umami flavors! I have a recipe coming out soon that uses this crumble! I just made this delicious savoury crumble! Great recipe! Thanks! So great to hear! Glad you loved it! I make tacos with it and also put it in salads (my ultimate taco salad recipe)! enjoy! This recipe makes about 2 cups of crumble...as far as 'serving' it really depends what you use it for! I add them in tacos, breakfast has, stuff them in peppers, or top them on a salad! Enjoy! Thank you. Gonna make them today. So excited! awesome!! Let me know how it turns out! I want to try this! What do you think about using dry sundried tomatoes instead of oil-packed? Yes! I think that would work for sure! I typically drain out as much oil as I can from the oil-packed ones in a jar. If you feel like the consistency is off, just add a tiny bit of olive oil, but I think it'll be great still! Let me know if you try it! This crumble sounds so flavorful! bet it'd be great in a burrito! Thinking of trying this with different seasonings to make it more like Italian sausage for my Thanksgiving dressing recipe. What do you think? Yes! I think that would definitely work...if it's just the dry seasonings, it'll totally still be fine. and i can see this turning into a delicious italian flavor also! Let me know how it goes! Thanks Anjali! I’ve been looking for a replacement for soyrizo. I’ve been told some of the processed soy products (soy protein isolate) out there may increase breast cancer risk for those with high risk! I’m inspired by your creativity! Thank you!! Yes...this is my version of soyrizo!! Obviously slightly different in ingredients and texture, but so delicious!! 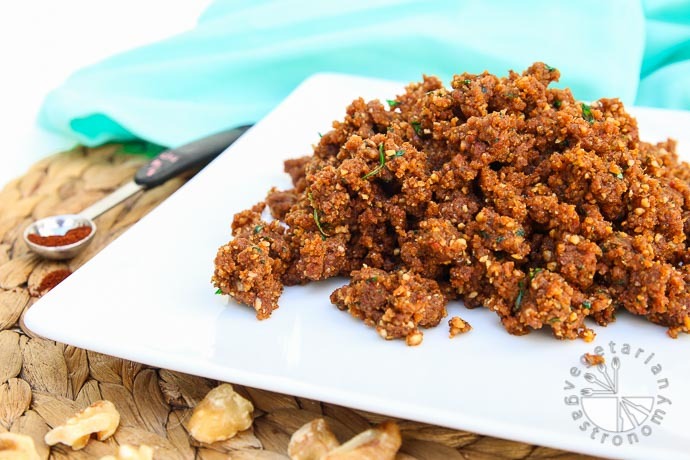 I wanted something similar to soyrizo concept but I was never a fan of store-bought and the ingredients in there. So this version is delicious and you should be ablet o use it the same way! If you need a nut-free version let me know. Yes, please, I’d love a nut free version, too! I was researching recipes for a vegan wedding luncheon . Vegan is WAY out of my wheelhouse! I made the Walnut Crumble with the Cilantro sauce in the recipe. MY GOODNESS! My totally non-vegan family and co-workers loved it! Made it exactly as written! Yay what a great review!! thank you so much...and yes this is a favorite among my non-vegan friends as well! It goes so well with so many dishes! Try my taco recipe using this crumble next! I'm hoping to have a new recipe up with this crumble soon! thanks again so glad it worked out for the wedding luncheon! Hi, my kids are allergic to walnuts...any alternatives you suggest? Thanks!